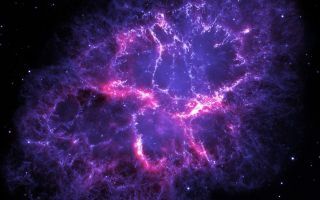 This beautiful space wallpaper is a composite image combining a new infrared view of the Crab Nebula, obtained with ESA’s Herschel Space Observatory, with an optical image from the archives of the NASA/ESA Hubble Space Telescope. This beautiful space wallpaper is a composite image combining a new infrared view of the Crab Nebula, obtained with ESA’s Herschel Space Observatory, with an optical image from the archives of the NASA/ESA Hubble Space Telescope. Herschel’s observations are shown in red and reveal the glow from cosmic dust present in the nebula. Hubble’s view, in blue, traces oxygen and sulphur gas in the nebula. A team of astronomers studying the nebula with Herschel has revealed that this supernova remnant contains much more dust than they had expected – about a quarter of the mass of the Sun. The new observations also revealed the presence of molecules containing argon, the first time a noble gas-based molecule has been found in space.